Unofficial BlackBerry Storm OS 4.7.0.99 leaked | BlackBerry Blast! 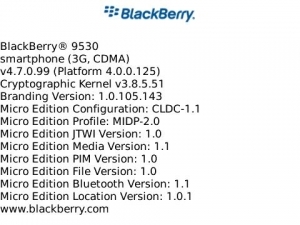 Another unofficial operating system for the BlackBerry Storm 9530, version 4.7.0.99, has been released in the wild. It was just on January 21st that version 4.7.0.90 was leaked. This is an unoffical version so users should install at their own risk.